Alberto Passalacqua will lead an Iowa State research team that will study, model and develop design tools for autothermal pyrolysis, a new way to break down corn stalks, wood chips and other biomass to produce a liquid bio-oil for energy and a biochar for fertilizer. Passalacqua is pictured with the pyrolysis pilot plant at Iowa State's BioCentury Research Farm. Larger photo. Photo by Christopher Gannon. AMES, Iowa – On a whim, Iowa State University’s Robert C. Brown asked students to crank up the oxygen. Brown and the engineers in his research group had worked for years to develop a thermochemical process called fast pyrolysis to produce biorenewable products. The process uses heat in the absence of oxygen to break down corn stalks, wood chips and other biomass to produce a liquid bio-oil for energy and a biochar for fertilizer. The engineers had explored adding a little oxygen to the reactor. Brown suggested adding more and more. And that started to change everything. Now, rather than trying to improve pyrolysis by pushing more heat from outside the reactor, the engineers discovered burning a small amount of biomass inside the reactor could more efficiently provide the energy to drive pyrolysis. Importantly, this partial combustion didn’t hurt the yield of bio-oil, said Brown, the director of Iowa State’s Bioeconomy Institute, an Anson Marston Distinguished Professor in Engineering and the Gary and Donna Hoover Chair in Mechanical Engineering. Iowa State engineers call this process “autothermal pyrolysis.” The Iowa State University Research Foundation has applied for patent protection on the technology and has licensed it to Easy Energy Systems of Mankato, Minnesota, for commercial use. Others have experimented with adding oxygen to their pyrolyzers, but Brown said a review of the scientific literature didn’t find much success. In many cases, researchers dramatically reduced their yields of bio-oil. 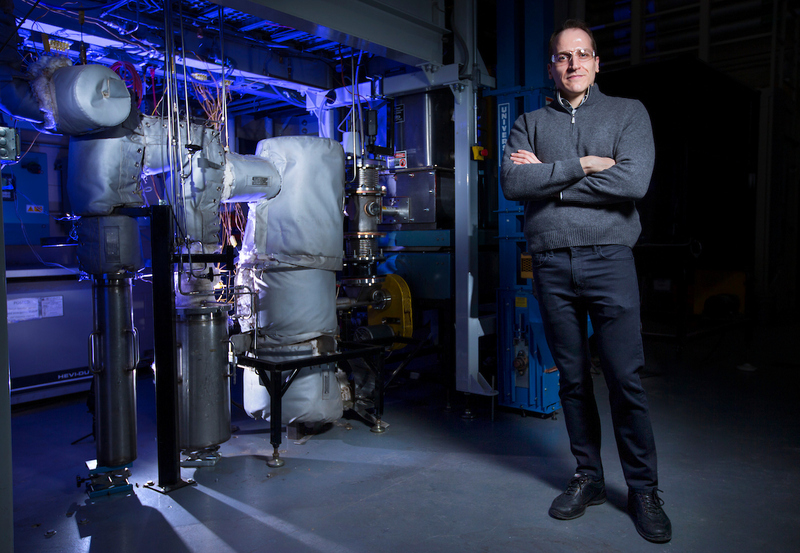 As the Iowa State engineers continued to study autothermal pyrolysis, graduate student Joseph Polin decided to substitute inexpensive air for the pure oxygen used in earlier tests. Polin found that to keep air-fuel ratios similar to the experiments with pure oxygen, he needed to feed biomass into the reactor five times faster. Brown was initially skeptical the reactor was big enough to handle so much more biomass. But it did. Iowa State engineers know their autothermal process works. But they’re still not sure exactly how. Brown thought carbon monoxide and methane known to exit a conventional pyrolyzer might be burning during autothermal pyrolysis. Iowa State graduate student Chad Peterson proved him wrong using a simple computer model that demonstrated pyrolysis temperatures are too low to ignite these gases. A new research grant should help find some answers. The U.S. Department of Energy recently announced it has awarded Iowa State engineers a two-year, $854,039 grant to study autothermal pyrolysis and develop software tools to help design other kinds of autothermal processes. The grant from the department’s Advanced Manufacturing Office is part of $35 million awarded to 24 research projects across the country. Final details of the Iowa State project are being negotiated. Alberto Passalacqua, an Iowa State assistant professor of mechanical engineering, will lead the Iowa State project. This isn’t the first time Iowa State researchers have been involved with an Energy Department grant related to autothermal pyrolysis. In December 2016, the department awarded a five-year, $70 million grant that helped launch the Rapid Advancement in Process Intensification Deployment Institute, known as RAPID. The American Institute of Chemical Engineers in New York City leads the RAPID Institute. Iowa State’s role is to manage the institute’s biorefinery efforts, including demonstrations of autothermal pyrolysis with the university’s commercialization partner, Easy Energy Systems. “What we have achieved is process intensification – multi-fold increases in biomass throughput for a given size reactor – while preserving oil yield,” Brown said. Passalacqua, who has expertise in multiphase flows and computational fluid dynamics, said he’s hoping to develop design tools that will help manufacturers maintain that intensification at larger scales. The Iowa State engineers expect their design tools will be added to an open-source toolbox that is freely available to use. That could help reduce the risk of scaling up the technology for commercial use. And it could help apply the autothermal principle to other chemical processes. The engineers think the reactors’ performance could ultimately do a lot for the bioeconomy’s bottom line – a research summary for the latest grant says the jump in biomass feed rates made possible by autothermal pyrolysis could reduce the estimated cost of producing fuel from $3.27 per gallon to $2.58 per gallon. Iowa State University engineers have developed a process called autothermal pyrolysis that breaks down biomass for fuel and fertilizer. A recently announced grant from the U.S. Department of Energy's Advanced Manufacturing Office will support studies of the process, including development of models and design tools that could help reduce the risk of scaling up the technology for commercial use. In addition to Alberto Passalacqua and Robert C. Brown, the research team includes Shankar Subramaniam, a professor of mechanical engineering; Mark Mba-Wright, an assistant professor of mechanical engineering; and Ryan Smith, the deputy director of the Bioeconomy Institute’s Thermochemical Research Program. The researchers will also hire one postdoctoral research associate and three doctoral students.